(HIT) -- Outdoor entertaining is sweeping the nation with its popularity. As porches, gazebos, and pergolas become outdoor rooms fit for any event from rustic to luxurious, it's hard to imagine a get-together in your dining room ever again! As fall approaches, many people are thinking the same thing. Installing an enclosed garden structure will provide a party-spot away from the house that is as versatile as the outdoor living space. 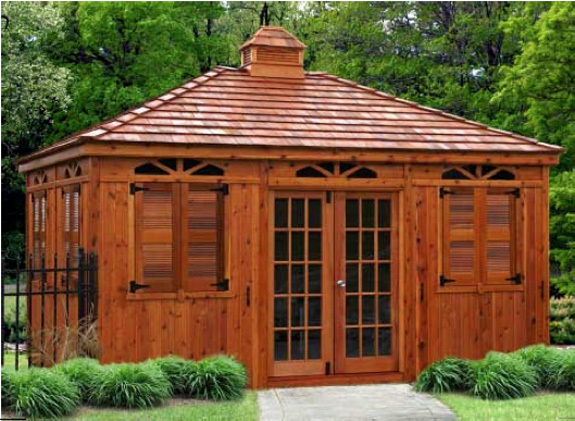 An enclosed structure can be used for simple storage, a studio, a quiet retreat, or party central! And, as people consider winter storage, winter entertaining, and the fear of being cooped up in the house for the rest of the season— autumn is the perfect time to get an enclosed garden structure. Rising gas and food prices may have put a damper on your plans to remodel this year, but there are some economical ways to update your kitchen. It's time for a fresh perspective on home organization. Start new by clearing clut- ter from your life and start fresh with a clean and clear home, and most importantly, a clear mind. The Knoxville Daily sun is privately owned. We reserve the right to refuse any editorial content, press releases, or advertisements.